A multi-sport star in college who was also a Phi Beta Kappa student, Battles put up significant numbers playing football for a small school. 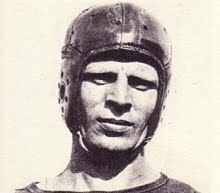 In 1930, he rushed for 354 yards, totaled 469 all-purpose yards, and scored seven touchdowns in a game against Salem College, and in another contest had three scoring runs of over 80 yards. While the team didn’t do so well when taking on stronger competition, Battles drew interest from several NFL teams and signed with the first-year Braves. Braves went 4-4-2 to finish fourth in the NFL. Battles ranked second in rushing to teammate FB Jim Musick with the re-named Redskins in 1933, gaining 737 yards that included 215 in a single game, making him the first NFL player to reach the 200-yard rushing threshold in a single contest. He was a consensus first-team All-NFL selection for his efforts. Running with a long stride, Battles had excellent cutting ability as well as speed, and was adept at returning kicks. He received primarily second-team All-NFL honors in 1934 and ’35 but was a consensus first-team selection in 1936 as he rushed for 614 yards and the Redskins finished first in the Eastern Division, although he was injured early in the NFL Championship loss to Green Bay. The franchise was shifted to Washington for 1937 and Battles set a league rushing record with 874 yards. The Redskins won the NFL title but, when owner George Preston Marshall refused to give his star runner a raise, Battles retired. Overall, he rushed for 3511 yards on 839 carries (4.2 avg. ), caught 38 passes for 546 yards (14.4 avg. ), and scored a total of 31 touchdowns. He received consensus first-team All-NFL honors three times and at least some first-team or second-team recognition after three other seasons. Battles, who initially became an assistant coach at Columbia, was later head coach of the AAFC’s Brooklyn Dodgers. He was inducted into the Pro Football Hall of Fame, Class of 1968.